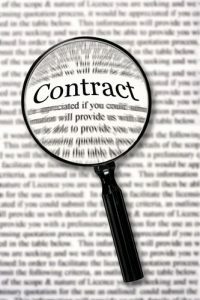 Los Angeles Employment Contract Lawyers: Accepting a job with an employer can involve entering into an employment contract, which may detail the terms of employment, the required job duties and/or the agreed-upon compensation and benefits. When employers fail to honor the provisions in these contracts, employees can sue for breach of contract. Additionally, if an employer has engaged in fraud during the hiring process or the term of employment, employees may also have grounds to pursue legal action against employers. Retaliated against you for pointing out – or taking legal action following – breach of contract or fraud. Assigning employees to duties that violate the terms of the contract. Committing tax or insurance fraud in relation to employees’ income or coverage. Here, it’s crucial to note that, when employees stand up for their rights and report any breach of contract or employer fraud, state and federal laws protect them against retaliation from an employer (e.g., a demotion, firing, pay reduction, etc.). If you have been subjected to an employer’s fraudulent actions or breach of contract, contact a Los Angeles employment law attorney at the Azadian Law Group, PC for a free case review to find out more about your options for recovery and justice. Our experience lawyers exclusively represent employees and, in three years alone, we have recovered more than $30 million for our clients. Call us at (626) 449-4944 or send us an email via this contact form to find out more about how we can help you. If you choose to move forward with us, you will not have to pay us any legal fees until or unless compensation is secured for your case. Our employment law attorneys provide exceptional legal service and representation to people throughout Los Angeles County, Riverside County, San Bernardino County, San Diego County and the state of California.